leg from the inner thigh to the ankle. This is the length you need. thigh and the ankle. The Pedi-Wrap is intended to cover the full length of the patient’s leg. It should be fitted as snugly (yet comfortably)as possible around the leg. First off let me say great customer service! I recommend calling to place your order so you can choose from the many different print designs they have. We just got our daughters in the mail and they are awesome, more comfortable, and appealing then her last pair from a different company! The price is very affordable and they got her fast. 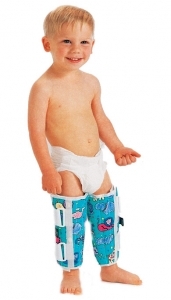 About 2 years ago I bought the Pediatric Leg Immobilizers. For my daughter who has verious medical complexes, including Cerebral Palsy. I ordered by phone absolutely great customer service! !!! I received them the next day. They worked perfectly did exactly what I wanted them to. Her spastic legs keep her from keeping them straight. So using those has helped keep her legs stretched. I have received many complements on them from verious Special Education Teachers and Physical Therapists. 2 years later they are still working perfectly. Very good quality!! Thank You! !